Great News!!! 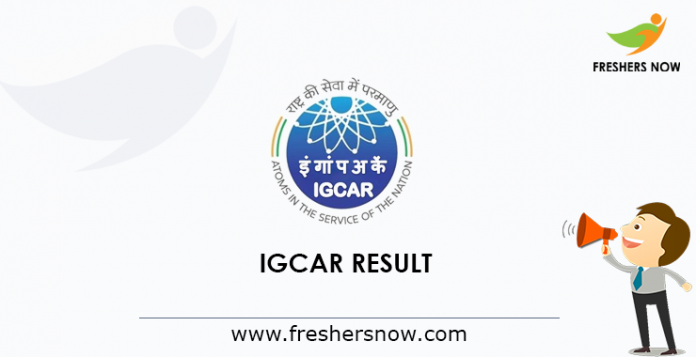 IGCAR Result 2019 Released on 17th April 2019. The officials of the Indira Gandhi Centre for Atomic Research (IGCAR) had conducted the exam on 11th, 12th, 13th Jan 2019 for the 248 Technical Officer, Scientific Assistant, Stipendiary Trainee Category-I, Technician, Stipendiary Trainee Category-II, Upper Division Clerk and Administrative Posts. Moreover, participants can download the IGCAR Stipendiary Trainee Result 2019 from the official site @ igcar.gov.in. Furthermore, we have given detailed information of IGCAR Cut Off Marks 2019, IGCAR Merit List 2019 in the below sections. Along with the stepwise procedure to download the Indira Gandhi CAR Result 2019. Additionally, we have also given the direct link to download the IGCAR Result 2019 at the bottom of the post. We heard that many of the candidates had attended the exam which was held on 11th, 12th, 13th January 2019. Those participants are eager to know their IGCAR Result 2019. Those candidates can download the IGCAR Stipendiary Trainee Result 2019 from the official site on 17th April 2019. Besides, we have also given the direct link to download the Indira Gandhi CAR Result 2019 at the end of the post. Based on the performance in the written exam the candidates will be called for the further selection process. The IGCAR Merit List 2019 is for the officials to get an idea of the qualified candidates. IGCAR Merit List 2019 contains the top or high marks scored candidates. These list of candidates have some priority while attending the next stage of the selection process. Those rounds will be Skill Test, Personal Interview, Certificate Verification. If the candidate qualifies then he/ she will get a chance to be placed for the particular post. Those candidates will be hired for the 248 Technical Officer, Scientific Assistant, Stipendiary Trainee Category-I, Technician, Stipendiary Trainee Category-II, Upper Division Clerk and Administrative Posts. Many candidates are facing problem while downloading the IGCAR Result 2019 for the 248 posts. So to help those candidates we are giving the direct and easy steps to download the IGCAR Stipendiary Trainee Result 2019 from the official site. Either you check the direct link to download the IGCAR Result 2019 given at the end of this article. Candidates must visit the official site of the Indira Gandhi Centre for Atomic Research (IGCAR) @ igcar.gov.in. IGCAR home page will visible on the screen. Now, On the home page only, you can see the Download Score Card and the Result for Stipendiary Trainee Category- II- Group “C” post and Administrative Posts – Group “C” post. Now, to check the scores, you have to enter the Registration No and Registered login password. Then click on login key and your Scores Will appear. Download the Score Card along with the IGCAR Stipendiary Trainee Result 2019. And take a hard copy of it & use it for future use. We believe that we have given sufficient information about the IGCAR Stipendiary Trainee Result 2019 in this post. If you have any quires or any suggestions drop a comment in the comment box given below. to get all such latest updates, visit our official page @ freshersnow.com. Furthermore, You can also bookmark our page using Ctrl + D to get notifications.